Tell your child that the test will be used to evaluate how well a school or school district is educating its students. It's important for kids to have a sense of the broader context. Explain that test scores are looked at along with many other pieces of information in determining your child's achievement level. Her grades and progress over time, for example, are also very important. This may be a big test, but it is still just one test! 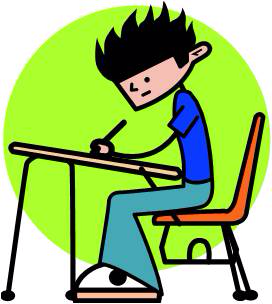 If your child is a very nervous test-taker, have her do deep breathing exercises before the test. She can take a deep breath and count to ten. Then have her take shorter deep breaths in between passages or sections of the test -- counting to three only. This exercise is fast and simple, but it really works! Go over with your child when and where the test will be given. Make sure she knows what will generally be covered on the test and roughly how long it will take to finish it. Your child's school will probably send home a letter before the test with much of this information. Have your child dress comfortably in layers so that he can take clothes off or put them on, depending on the temperature of the room. Pack him a light nutritious snack, but avoid salty foods that may make him thirsty later in the testing session. Finally, tell your child that the test will have some difficult questions on it. All of the questions are not supposed to be easy. Explain that she may not be able to answer all of the questions, and that's expected. All she can do is try her best, and that's okay!